Things at the Jennings house were getting very hectic on The Americans Season 4 Episode 12. Paige and Elizabeth arrived home after the "mugging," and Paige could hardly catch her breath. But that didn't mean Paige didn't want to hear any more about her family and their business. In fact, the trauma had the opposite effect. Paige wanted to know as much as possible and as truthful as possible. At the FBI, they were cracking down on all the unknowns, starting with the mail robot. They would not let that little, wicked machine get the better of them. There was a surprising development that meant all hands on deck at the FBI and would start bringing all of The Americans stories together. 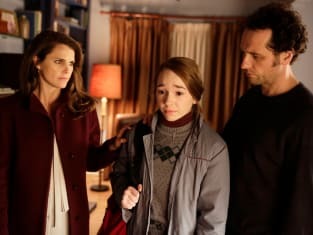 Find out what it is when you watch The Americans online. Click above to get started!